At this year's Cinema Arts Festival, they showed two movies by Meredith Danluck. Art Hard (which I'm sorry to say you missed--it played yesterday) is a feature documentary. North of South, East of West combines two genres--narrative feature film and experimental film. North of South, East of West is playing three more times on Saturday, November 9, and Sunday November 10--so you can just catch it. The whole idea of creating the world's largest artwork seems megalomaniacal (and ridiculous), although that's mitigated by the piece's impermanence. Deneven's crew seems mostly concerned with drinking and having fun--they don't quite get the work. Deneven explains that his mother was a math teacher, and that this work relates to that (it's very geometric). 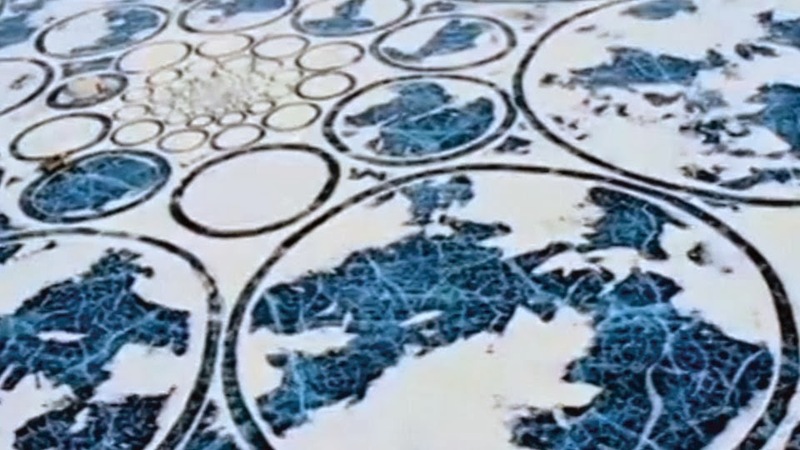 In the end, the appeal of the work (when seen from the air) is that the circles focus your attention on the naturally formed skein of white cracks in the deep blue ice. 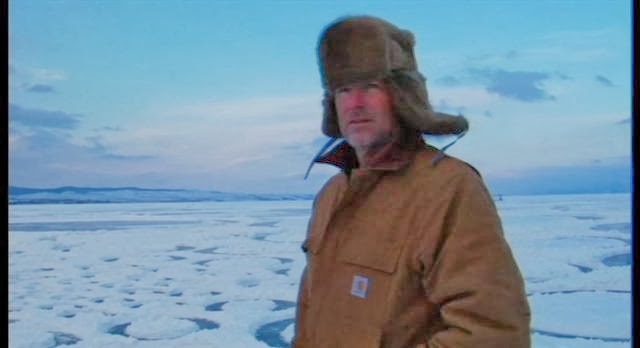 The documentary has a casual, matter-of-fact style. It doesn't try to inform as much as immerse the viewer in the experience. Watching Art Hard would in no way prepare you for North of South, East of West. It's a fiction film that follows several characters, Yvonne (played by Sue Galloway, a regular on 30 Rock), Dale (James Penfold), an auto worker whose name I didn't get (Ben Foster, currently in the theaters playing William S. Burroughs in Kill Your Darlings) and Miguel (Erik Quintana). Their stories are more-or-less unrelated, but the characters cross paths. So far, not unlike a typical narrative film. But what Danluck does that's quite odd is that she shows their stories on four screens, formed in a square, with the audience sitting in the middle. A viewer simply cannot watch all four screens at once. You sit in a swivel chair and are constantly spinning around. She could have done this film on one screen, switching from character to character as their stories progress and occasionally intersect. 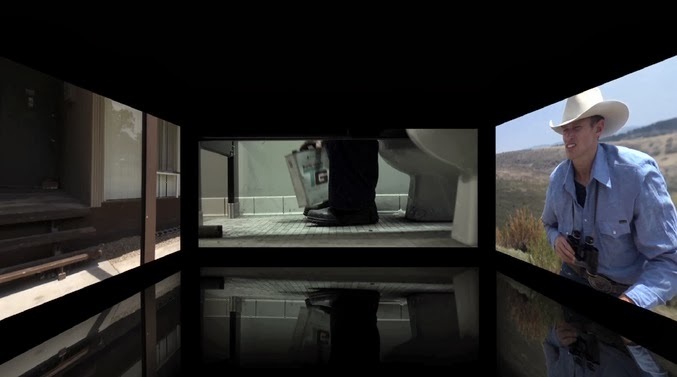 Instead, what happens in the four screen version is that when the viewer is supposed to be paying attention to one screen, the other screens show something banal and boring--someone in a shower, a horizon, the night sky, a character watching TV, etc. For the most part, it's obvious what screen you are meant to be watching at any one time. But not always--sometimes Danluck forces you to choose. And sometimes, you may be watching a bit of dialogue one one screen when something trivial but engaging happens on the second screen. (For instance, when the very stoned Miguel makes a taco out of a tortilla and Oreos). The plots are fairly simple: the auto worker is a drug-addicted gambler who owes a bad guy $10,000 and decides to get out of town, thinking about going to Las Vegas after a conversation with Yvonne. Yvonne is a frustrated actress and unsuccessful cosmetics saleswoman who is given the job of driving a pink company Cadillac (which she picked up from the auto worker at the plant in Detroit) to Las Vegas, where it will be given to some sales champion at the company's annual convention. Dale is a rancher with a dislike of cops who gets thrown in jail overnight for messing with one, then has another encounter with one at the end of the movie. Miguel is a young heavy metal musician working for minimum wage at a cafe with occasional odd jobs for Dale who decides to make a big score by delivering drugs for the local drug kingpin. Dale and Miguel live near Marfa, and Yvonne drives through on her way to Las Vegas from Detroit (yes, I realize this makes no sense geographically). These plots seem fairly conventional (at least for indie cinema), and except for the long stretches of nothing happening when the viewer is looking at another screen, they are filmed in more-or-less classical cinema style. However, if you chose to look at just one screen, it would very much seem like an experimental film--some bursts of action followed by extremely long slow periods of inactivity. Hence the whiplash--you are constantly whipping back and forth to look at the screen with the "action." At one point, all four screen go into the "experimental" mode at once--they each show extended sequences of TV screens, representing what the characters are watching. This combination of experimental and traditional narrative film is quite bracing. I was gripped by this film all the way to its rather abrupt ending. North of South, West of East is never coming to a theater near you--it only works with four screens in an "in the round" setting. You have three more chances to see it this weekend. I highly recommend you do.